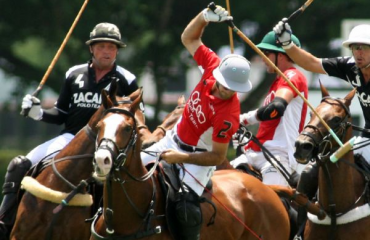 All photos, unless otherwise noted, are by Allen and Kim MacMillan and Tammy Brown/Copyright MacMillan Photography. Photos may not be reproduced without permission. 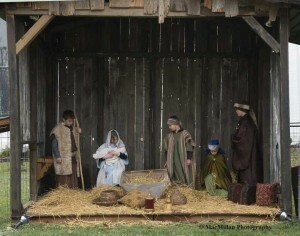 Photos are available for purchase at photo@looncreekenterprises.com or 260-468-2392. 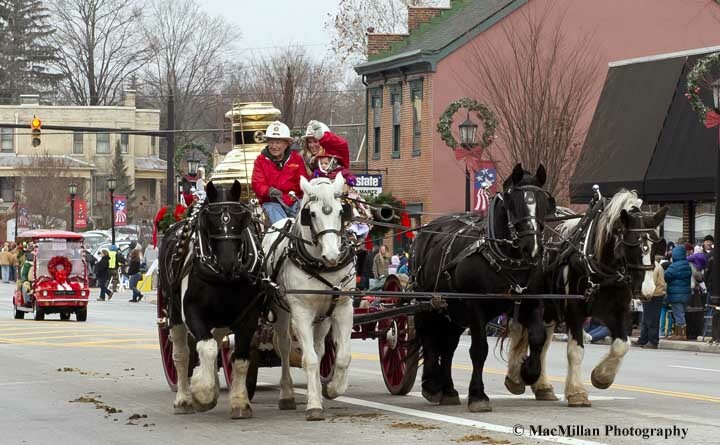 The historic city of Lebanon, Ohio, is magically transformed into a holiday wonderland the first Saturday in December every year when their annual Christmas carriage parade comes to town. This year was the 26th year for the Lebanon Christmas Festival and Carriage Parade. 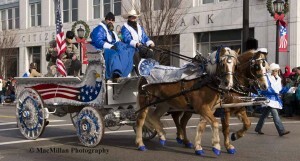 In 2014 the parade included over 100 entries from four states. Parade entries ranged from Minis pulling small wagons up to six-horse draft teams pulling beer wagons and include many restored antique carriages and sleighs. 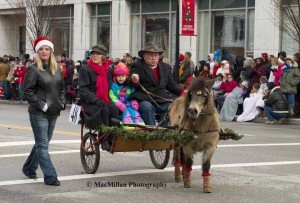 Over 20 different breeds of horses and ponies, as well as donkeys and mules, pulled the various carriages, carts and wagons in the 2014 parade. 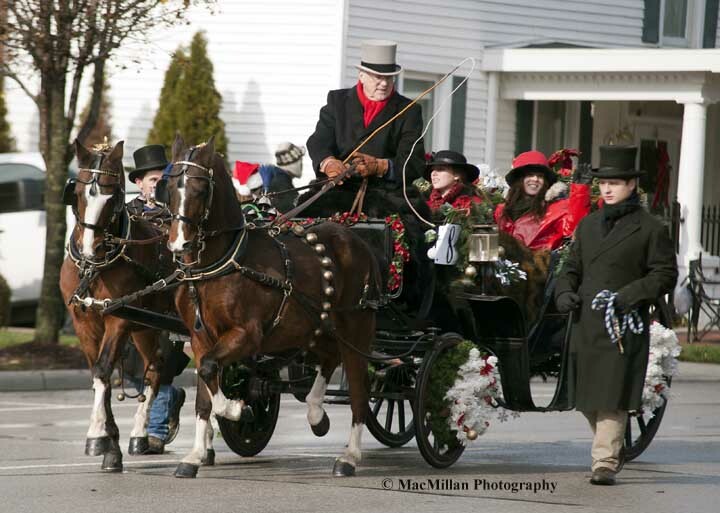 Entries were decorated for the holidays and the drivers, passengers and grooms were dressed for the occasion, many in period costumes styled to match the antique vehicles. This year’s parade dignitaries included Santa and Mrs. Claus, the mayor of Lebanon and the Grinch, who in this case, happily, did not steal Christmas. There are two parades each year, one right after lunch in the afternoon and another in the evening when the lanterns on the carriages and the Christmas lights lining the streets create a magical atmosphere. 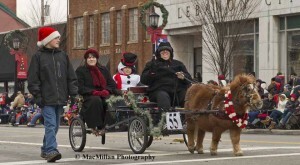 The entire city of Lebanon gets into the spirit with a street festival and holiday happenings including: free horse-drawn wagon rides; tours of the historic Golden Lamb Inn and the 18th century Glendower Mansion; photos with Santa and Mrs. Claus; rides on the North Pole Express vintage train; a gingerbread house display; a Christmas play at the local theatre; “Winter Wonderland” at a local tree farm; a living nativity; breakfast with Santa; a holiday light display, and live entertainment on the downtown stage. 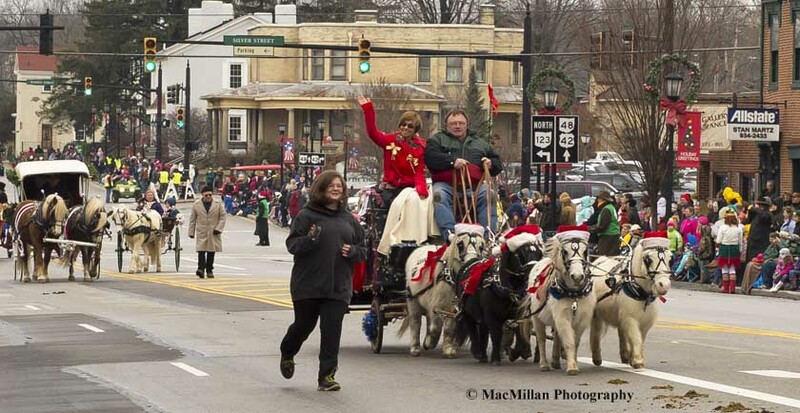 Another long-time parade participant and resident of Lebanon, Linda Freeman, proudly conveyed Santa and Mrs. Claus into town this year driving her two Hackney Horses to an antique sleigh (put on runners for the parade). “This is the twenty-third time I have been in the parade. 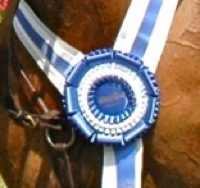 It’s changed a lot; I’ve used different horses and carriages over the years. It’s always fun dressing up in Victorian costumes and ‘pretending’ for the parade. 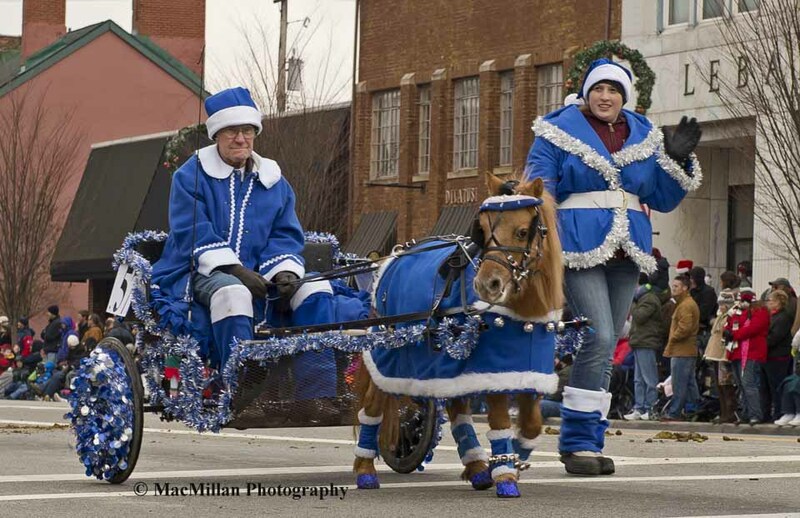 I like to participate in the parade because I am an enthusiastic, recreational driver and I like to use my horses in as many different situations as I can. It is fun. 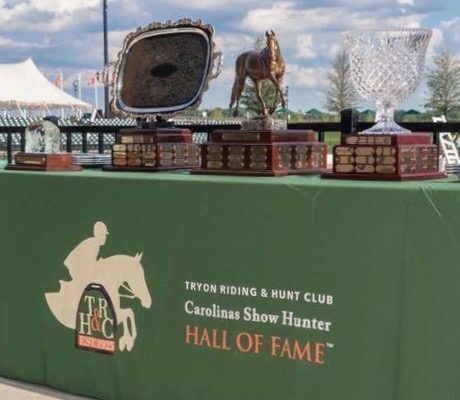 It takes hours and hours and hours of work to get ready for a parade like this, but it is a neat opportunity to give something back to the community by volunteering to be in the parade,” said Freeman. Lebanon, which was founded in 1802, is situated about half way between Dayton and Cincinnati just east of Interstate 75 and to the north of Interstate 71. 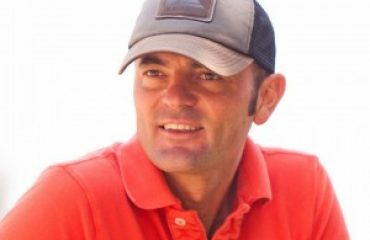 Famous former Lebanon residents include astronaut Neil Armstrong who lived with his family on a farm outside of the city after his lunar landing mission, actor Woody Harrelson of Cheers fame, and Thomas Corwin, governor of Ohio from 1840 – 1842 and U.S. Senator from 1844 – 1850. Two motion pictures were filmed in Lebanon, Harper Valley PTA starring Barbara Eden in 1979 and Milk Money featuring Ed Harris and Melanie Griffith in 1994. 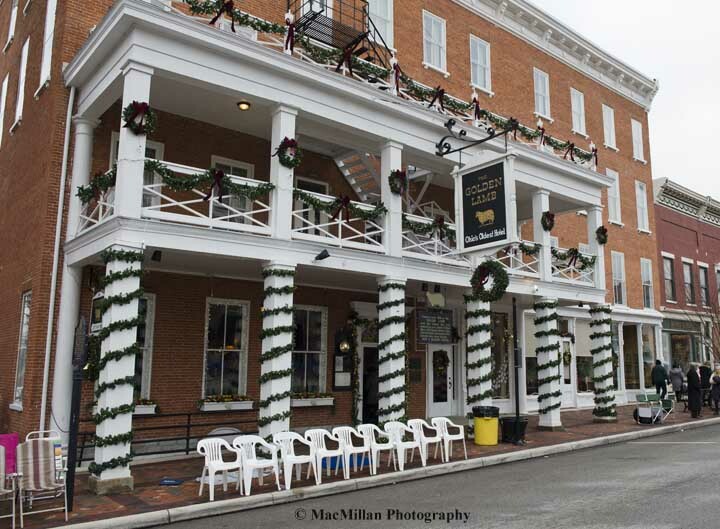 Beyond the arts and craft booths at the Christmas Festival, Lebanon has a plethora of shopping and dining opportunities including a large antique mall, many small specialty shops and the Golden Lamb Inn. The inn was built in 1803 and is on the National Historic Register. Twelve U.S. presidents from John Quincy Adams to George W. Bush and a large number of other famous people including Mark Twain, Charles Dickens and Harriet Beecher Stowe have stayed in the inn. Festival attendees can dine in the inn or take a peek at the rooms where these famous people have stayed. We wish we could show you every entry in the 2014 parade, but space does not allow. They were all awesome! See below a sampling of the entries. 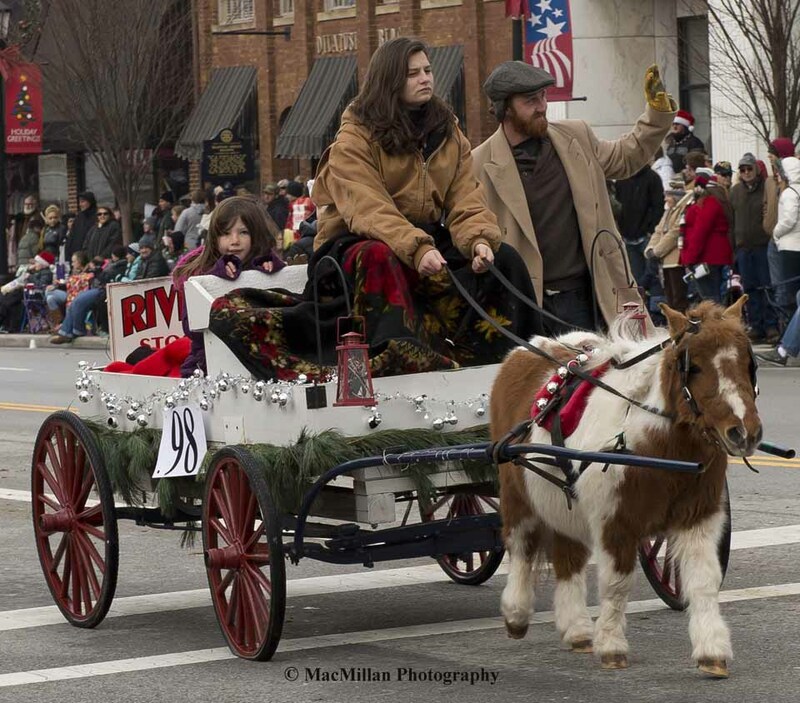 We encourage you to experience the parade for yourself in 2015! 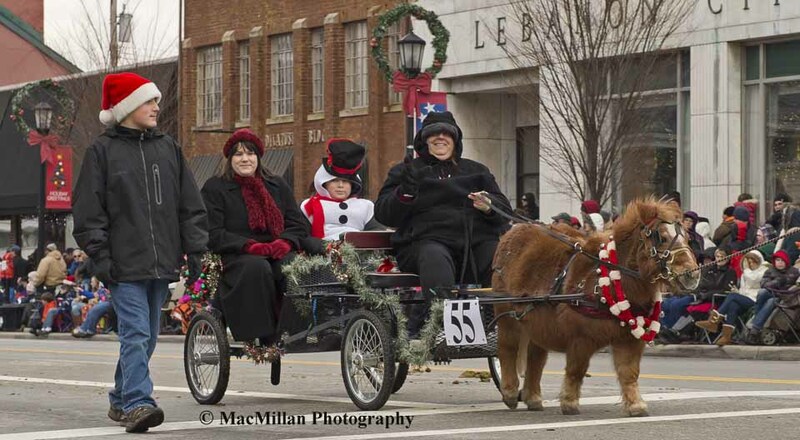 Next year’s Lebanon Christmas Festival is Saturday, December 5, 2015, with parades at 1 and 7 p.m. Eastern Time. 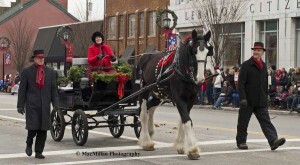 Other festival activities run from 10 a.m. to 8 p.m. For more information about attending or participating in the Lebanon Christmas Carriage Parade and Festival contact the Lebanon Chamber of Commerce, 513-932-1100 or sara@lebanonchamber.org or go to http://www.lebanonchamber.org/. 1-Opening the parade and carrying the American flag was the Patriot Farms Hitch of Haflingers Casey and Patty driven by Garth Louth. The Louth family, Rockford, Ohio, paid tribute to U.S. troops serving around the world and asked the crowd to remember veterans and their families during the holidays and throughout the year. 2-Driver Linda Freeman (dressed as the toy soldier) of Lebanon, Ohio, had the honor of delivering Santa and Mrs. Claus to town. She drove her two Argentinean-born Hackney Horse geldings Brownie (age 17 on the driver’s left) and Bill (age 15 on the right) to a circa 1880’s antique Hudson Valley six-passenger sleigh which was mounted on wheels for the parade. The sleigh is owned by Michael and Carol Burke, Loveland, Ohio, (who are riding in the sleigh as Santa and Mrs. Claus respectively). 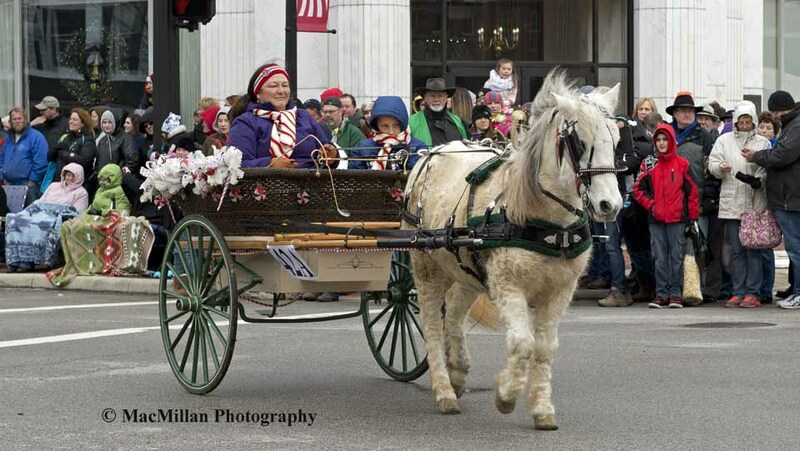 The sleigh cost $20,000 to restore and the 2014 parade was the first time it had been put to horses. The sleigh was accompanied by out walkers dressed in period costumes, both from Lebanon: Tracy Raikes, who is walking Linda’s rescued “pound puppy” Darwin, and Tracy’s son Christopher (not shown in the photo). 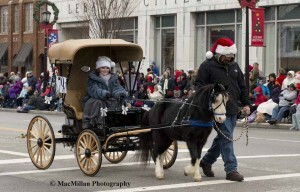 3-A peek down Broadway Street, the main drag of Lebanon, shows in the foreground parade entry number 41, an six-horse Mini hitch owned and driven by Judd Porter, of St. Louisville, Ohio, with Lebanon Mayor Amy Brewer riding shotgun with subsequent entries trailing behind them. 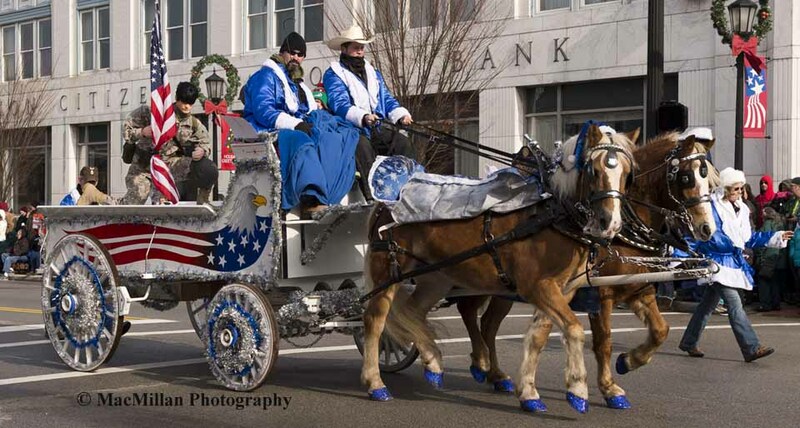 Around 185,000 people lined the streets of Lebanon to view the 2014 afternoon and evening parades. The parade was well organized with a large number of volunteers from the area and from the Ohio Horseman’s Council (dressed in either yellow or green vests) who helped with crowd control, answered questions and passed out complimentary festival programs. At the end of the parade the city street cleaner made the rounds to tidy up the “horse exhaust”. 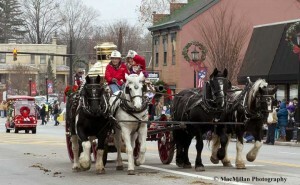 4-Charlie Poppe, Meadowbrook Farm, Cincinnati, Ohio, has participated in every Lebanon Christmas Carriage Parade since its inception in 1989. 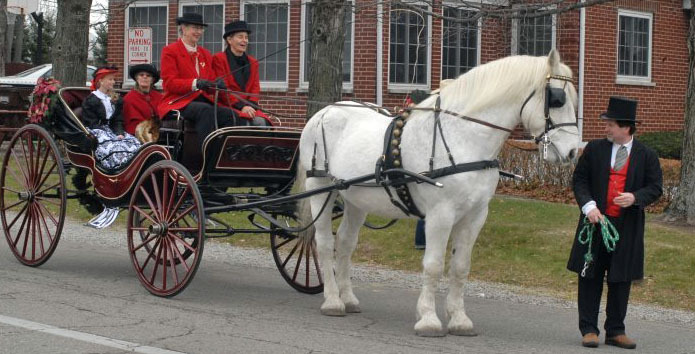 In 2014 he drove his Hackney Pony geldings Oh Canada (age 11 on driver’s left) and Facebook (age 9 on right) to an antique Victoria carriage built by the Mulbacher Company in Paris, France. The carriage was made for the first 1876 Centennial, the world’s first exhibition to commemorate the 100th anniversary of the U.S.A. (held in Philadelphia, Pennsylvania), where it earned a gold certificate for the best vehicle in the formal vehicles class. After the exhibition, Sarah Roosevelt, FDR’s mother, purchased the carriage for their Hyde Park Estate on the Hudson River. FDR used it for one of his inaugurations. The carriage is a ¾-size vehicle which was popular from the Civil War through around 1900 following the Spanish American War. The reason for making this size of carriage was to avoid their horses being requisitioned by the U.S. War Department for use by the Army; the Army was only interested in horses over 15 hands so the ¾-size vehicles were made to be pulled by smaller horses and ponies. Out walkers for Poppe’s carriage were Wade and Luke and their girlfriends rode in the carriage for the afternoon parade. Poppe’s extensive collection of about 40 historic carriages can be viewed on his Facebook page. 5-The Kroger grocery store chain owns an original Barney delivery wagon which was driven in the parade by Stan Voorhees. The wagon was used by the original Kroger family store based in Cincinnati, Ohio, in the late 1880’s. 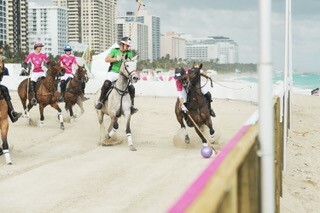 The wagon was pulled by two Percherons. 6-Bob and Angel Kilburn, Kilburn Farm, Morrow, Ohio, drove their two Percherons hitched to a festive red wagon. 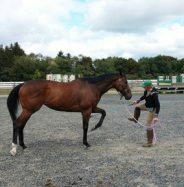 7-This cute 17-year-old Welsh-cross pony mare named Buckeye, is owned and driven Cindy Glaser, Mariah Pines Farm, Tipp City, Ohio. Buckeye is hitched to a circa 1900s wicker governess cart that was formerly owned by Sally Coop of Vandalia and was restored by the Glasners. This was Buckeye’s tenth time to participate in the Lebanon parade. 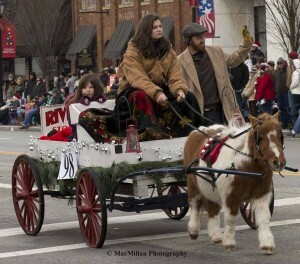 8-Steve Muterspaw of Lebanon drove his Mini mare Jenny to a sulky in this year’s parade. Steve’s passengers were his wife Susan and granddaughter Leanne Nicole Hawkins. Take note of Jenny’s Christmas socks! 9-This adorable Mini mare Savannah, who wore a festive garland around her neck, pulled a cart driven by her owner Karen Dalton, Franklin, Ohio, who was accompanied by her grandchildren. 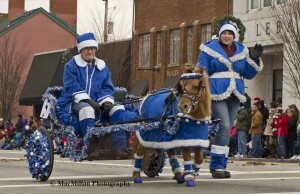 10-Art Brown, Rocky Creek Farms, Middle Point Ohio, proudly drove his blue and white clad Appaloosa Mini Gingersnap down Broadway during the parade. 11-The elves, a.k.a. the Leveck family from Jamestown, Ohio, were appropriately clad in red and green. Jane Leveck drove this Amish-made wagon pulled by mini donkeys Lilly and Bailey who were led by Kandy and Renee Leveck. 12-Junior driver Gretchen Green from Circle G Ranch, Burbank, Ohio, drove this flashy Mini to a doctor’s buggy. 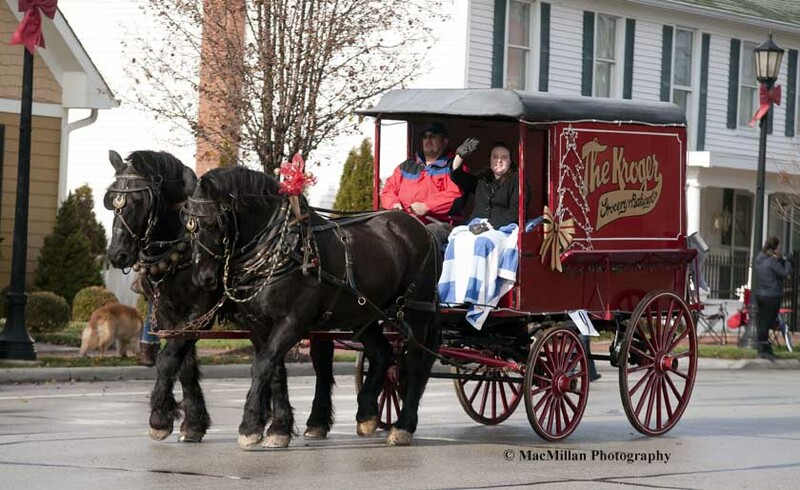 13-Resembling the previous Mini in color and markings, only in extra large size, this Clydesdale named Guiness pulled an Amish cart driven by his owner Karen Greene of Hillcroft Crescent Farm, South Charleston, Ohio. 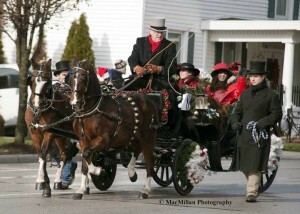 Karen and Guiness are accompanied by Don Marion walking alongside the cart. This was their first appearance in the Lebanon Christmas Parade. 14-Another first time entry in the parade was this petite buckboard wagon pulled by a pinto Mini from Riverside Topsoil and Stock Farm, Morrow, Ohio. Jessica Whitt was driving accompanied in the wagon by her family. 16-The Wells Fargo stagecoach driven by Ty Kukhan, Mason City, Iowa, and owned by Wells Fargo Bank. 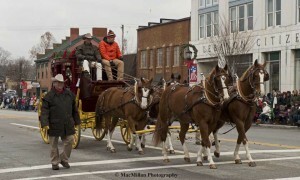 The coach is pulled by four matching chestnut Quarter Horses. Riding in the stagecoach are Brandi Aliaga with her daughters Maddie and Sophia and Robert and Robyn Buskirk and their children Elle and Ryan. 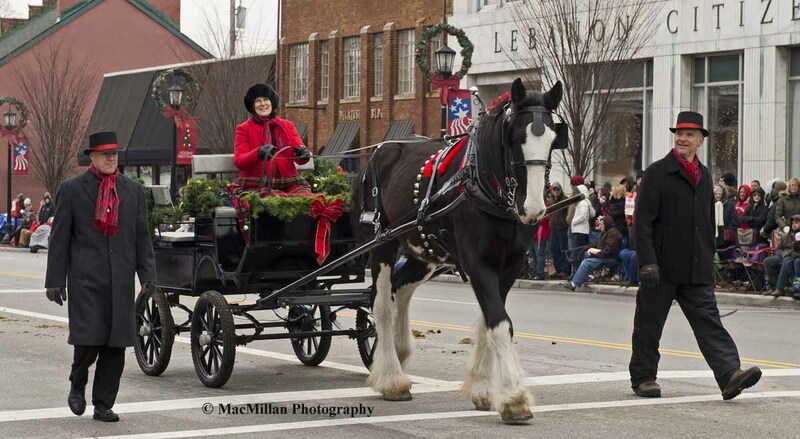 17-Making their seventeenth appearance in the Lebanon Christmas Carriage Parade was the six-horse Clydesdale team from Old Tyme Travel driven by Debbie Bechstein. The hitch was sponsored by Trihealth. 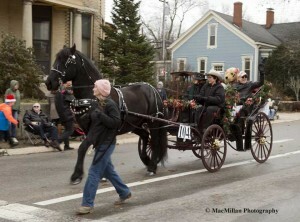 18-The six-Mini Horse hitch was a parade favorite. The adorable team is owned and driven by Judd Porter, St. Louisville, Ohio, with Lebanon Mayor Amy Brewer on the seat next to him and other Lebanon residents riding along in the back of the wagon. 20-The finale to the Christmas Carriage Parade is traditionally the 1892 Airens fire pumper owned by Jack Selvey and pulled by a four-abreast team consisting of Percherons and pinto drafts. This year four generations of one family were represented on the pumper, driver Gary Hopkins from Lynchburg, Ohio, with his daughter Greta Branham, grandson Josh Branham and great granddaughter Emma Branham. 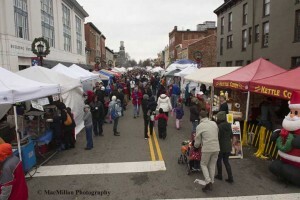 21-A wide variety of tempting treats and beautiful arts and crafts were available for purchase in the Christmas Festival Foods and Crafts Alley. In addition, downtown Lebanon has a large number of shops and restaurants open for business on parade day. 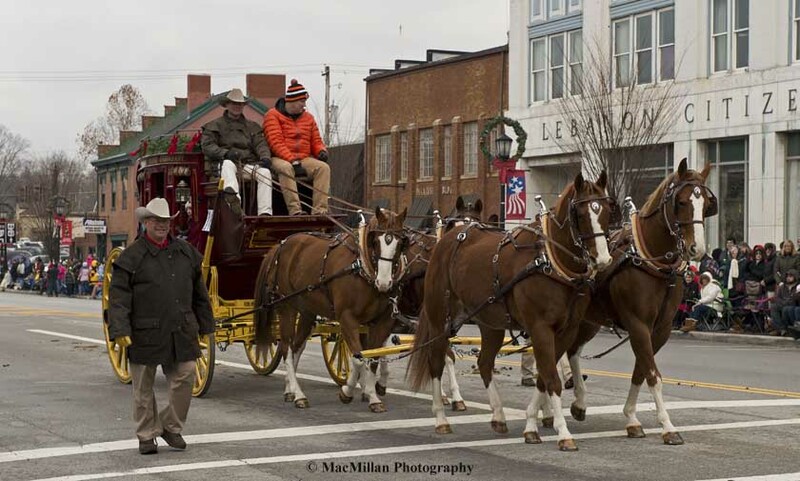 The Tack Trunk tack shop in Lebanon also has a holiday open house during the festival. 22-The historic Golden Lamb Inn is the oldest continuously operating inn in Ohio. 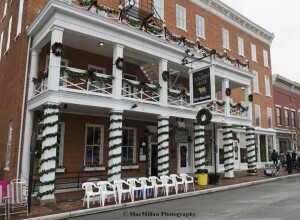 The inn was built in 1803 and is on the National Historic Register. Twelve U.S. presidents from John Quincy Adams to George W. Bush and a large number of other famous people including Mark Twain, Charles Dickens and Harriet Beecher Stowe have stayed in the inn. Festival attendees can dine in the inn or take a peek at the rooms where these famous people have stayed. 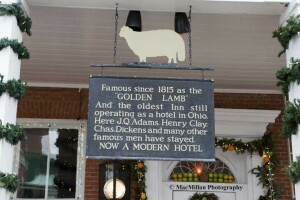 23-The sign hanging on the historic Golden Lamb Inn on Broadway Street in Lebanon. The inn has a tavern, a gift shop, four public and four private dining rooms offering a gourmet menu and four floors with forty total guest rooms. 24-In keeping with the holiday season the Lebanon Presbyterian Church youth group presented a living nativity on the corner of Warren and East streets.